I was looking around for archaeology addons, but there were none that I was in love with. So naturally, I decided to write my own. 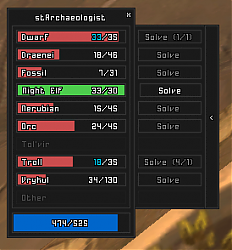 When you mouseover a progress bar, it will show you information on the artifact your currently working on. If you click on the progress bar, it will link the item in chat, that way you don't have to go digging through a loot addon or wowhead for the link. type /starch to toggle the window. Can you also add an option for it to have a keybind? Some new rares have been added to the game and its not possible for me to link into the chat like the other things. is it a part of your addon or blizzard default thingy? if its with your addon, will you update it? i mean... i really cant live without your addon for archeaology. period! 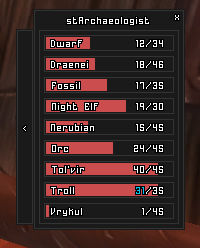 I plan on adding the same feature as my exp bar to automatically skin with Tukui (and ElvUI) as soon as I get home. Last edited by psycedelic : 03-17-11 at 11:36 PM. updated with stMedia and (hopefully) an actual fix to the keystones issue. Sorry all, was in a rush when I posted the update and forgot to package stmedia. I won't have access to any of my files until tomorrow, but I'll get it fixed when I do. Heres a quick fix for those like me that want to use this addon. Copy the Media folder from stExperienceBar into the stArchaeologist folder. Open stArchaeologist.toc file and delete the stMedia dependency. 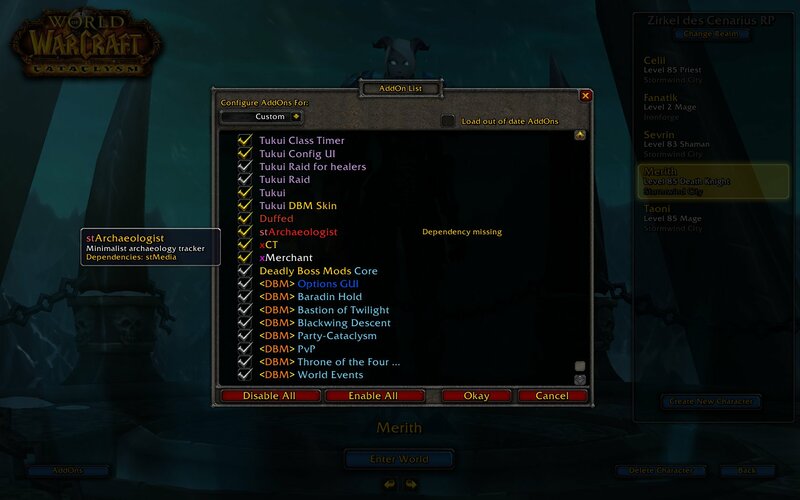 local font,fontsize,flags = [[Interface\Addons\stArchaeologist\Media\homespun.ttf]], 10, "MONOCHROMEOUTLINE"
save and boot into WoW and there ya go...you should have a working addon now. This point I should correct with version 1.1 and the correction for the keystones. It's miserable to release an Addon with an dependency without to include or release the dependency. With my suggested modifications v1.1 works perfectly fine. Last edited by liquidbase : 03-12-11 at 12:33 PM. i love the new color settings, sadly it still dont find my keystones but it dosent matter really for me now i just save em and sell them on ah. Not sure if the color is supposed to be black and transparent or if it has todo with ElvUI. Yea, there're other calls to the GetArchaeologyRaceInfo() function with wrong order of return parameters. However, I didn't look into the code if this causes serious malfunction. The calls appear at line 306, 742 as of version 1.2 (305 and 741 as of version 1.1). The error in line 306 is harmles, those parameters are never used. Line should be removed. Blizzard's doing a real mess of the APIs between even minor versions. Last edited by vlacko : 03-12-11 at 11:36 AM. I want to use your Addon, but after installing and log in to wow I get an Dependency Missing for an other Addon called "stMedia". I have take a look here on wowinterface but I didn't find it. You can see on the screenshot waht I mean. I want to use your Addon, but after installing and log in to wow I get an Dependency Missing for an other Addon called "stMedia". I have take a look here on wowinterface but I didn't find it. Last edited by liquidbase : 03-12-11 at 03:35 AM.